Whether you're having a gender reveal party, or you just want a cute way to let family and friends know that you are having a baby boy or girl, we've got our top 11 gender revealing ideas to help you make the big announcement. What’s a party without cake (or better yet, cupcakes)? By adding pink or blue food coloring to a white cake mix, you have a fun way to reveal your baby’s gender. Make sure you get enough frosting so that no cake peeks through. If you’re having multiples, have one colored layer for each baby. Of course you could also make one cake for each baby, because really, who doesn't like more cake? If you can handle the anticipation, have your ultrasound technician or OB write your baby’s gender on a piece of paper and seal it in an envelope. Open the envelope in front of your guests, or let an honored guest open it and announce what you’re expecting. If you’re having a party, gather everyone together and lift your shirt. You can decorate your bump with a ribbon or bow, or even with some makeup or body paint. If you’re shy, you can have a pink gift bow and a blue gift bow sitting on a table-- let your husband stick the right color bow on your shirt over your belly. If you’re not having a party, take pictures of your decorated bump and send them to the grandparents-to-be. Another balloon launch idea is to put several pink or blue balloons in a box. When you open the box the balloons will come flying out, revealing whether you’re having a boy or girl. Hit a reveal home run or score a reveal touchdown with these gender reveal baseballs or footballs. If either of you happen to be sports fans this might be a fun way to reveal your baby's gender, and if you want to reduce the chance of missing it - maybe hit it off a tee. Otherwise you might end up like this guy lol. Buy a onesie or outfit and wrap it up. You can either unwrap the box in front of your guests, or have a grandparent-to-be do it. If you’re not having a party, you can cut a piece of pink or blue construction paper into the shape of a t-shirt or rattle and mail it to anyone you want to announce the gender to. This idea is the most fun if there are going to be some older kids around. 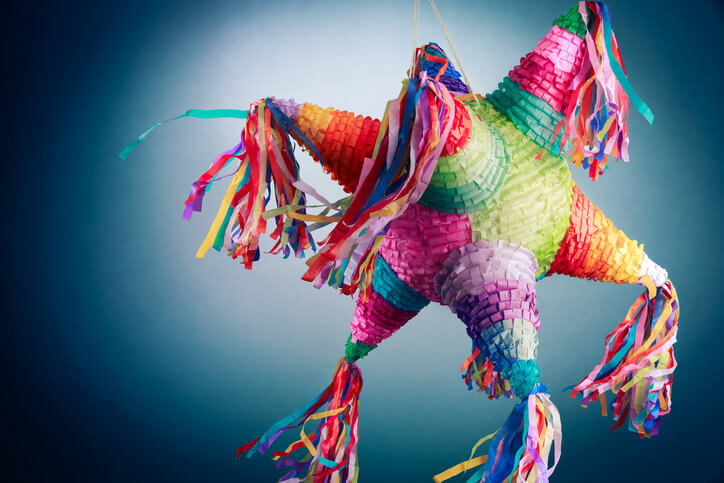 Fill the piñata beforehand with pink or blue candies. When the piñata is broken open, your baby’s gender will be revealed. If you don’t want to do all pink or all blue candies you can put in favorite candies with a pink or blue pacifier or baby doll. Whoever grabs the pacifier or doll gets to announce the gender. Fill a small chest or decorated box with something pink or blue--candies, a onesie, booties, or anything fun. Draw up a map and have your family and guests find the treasure chest. If you’re feeling adventurous you can even bury it. If you already have a child, buy or make a shirt that says, “I’m Having a Baby Brother” (or sister). Have the big kid keep their jacket zipped until it’s time for the reveal. This is also a great way to surprise grandparents who aren’t expecting to find out right then. See how long it takes for them to notice what the shirt says and wait for the big reaction! Use your printer or go to a store that makes enlargements. Blow up the ultrasound picture and put it on the wall. Make a cutout of a pink bow and a blue bowtie and put a small loop of scotch tape on the back. When it comes time to reveal the gender you can stick the pink bow on baby’s head, or the blue bowtie at baby’s neck. If you’re not having a party, make small copies of the ultrasound and put the proper decoration on it before mailing it to your friends and family.